Visit Ranzi during your stay in Liguria, Italy. A lot of archaeological evidence of the presence of pre-Roman Ligurian people as well as the Roman culture was found in this region. Even early Christianity and the Middle Ages have left their traces there, and complex Germanic and Roman properties can be found there. The medieval village and many of its streets and buildings are therefore themselves witness to that era. Ranzi consists of three hamlets: Santissima Concezione (Dranzù), San Antonio (Dransciù) and Santa Liberata (Caselle), and it has approx. the 300 inhabitants. 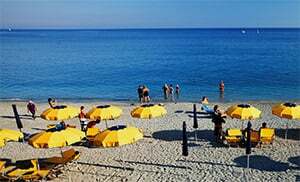 It used to belong to the municipality of Giustenice then it became an independent municipality in 1676; it stayed so for almost three centuries until it finally became part of the municipality of Pietra Ligure in 1928. Ranzi is a suburb of Pietra Ligure and lies above the A10 highway, about 3 km from the coast. From the highway, one can reach Ranzi through Via Ranzi.